Dynamite Entertainment is no stranger to steampunk. Their work Legenderry managed to throw Vampirella and the Green Hornet right in the thick of a Victorian world where the fashion was different, but the threats still the same. Now, Dynamite is looking towards the stars for their latest foray into the steampunk world, as Cylons will get their turn in Battlestar Galactica: 1880, written by Tony Lee, illustrated by Aneke and with covers by Ardian Syaf and Sergio Fernandez Davilla. Steampunk Battlestar Galactica: 1880 #1 will be solicited in Diamond Comic Distributors' June Previews catalog and slated for release in August 2014. 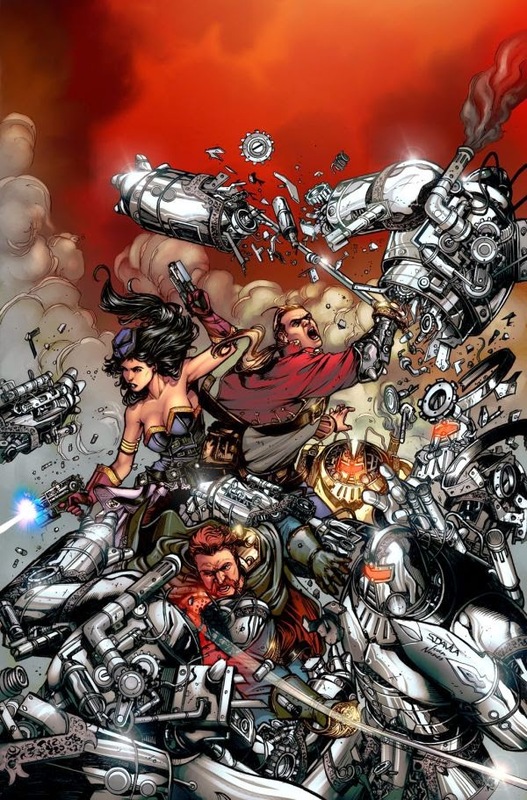 Comic book fans are encouraged to reserve copies of Steampunk Battlestar Galactica: 1880 #1 with their local comic book retailers. Steampunk Battlestar Galactica: 1880 #1 will also be available for individual customer purchase through digital platforms courtesy of Comixology, iVerse and Dark Horse Digital. May 19th, 2014, Mt. Laurel, NJ: Following Dynamite's incredible success with its first steampunk book, Legenderry, Battlestar Galactica is getting a steampunk makeover of its own with Steampunk Battlestar Galactica: 1880! Written by Tony Lee, with art by Aneke and covers by Ardian Syaf and Sergio Fernandez Davilla. Make sure to pick up Steampunk Battlestar Galactica: 1880 this August!